Adds Godden: “Millennials, who now [numerically] surpass all other demographics of workers, are very comfortable working with online tools in all aspects of their work and personal lives. If they can’t get the support they need at work, they quickly check out. 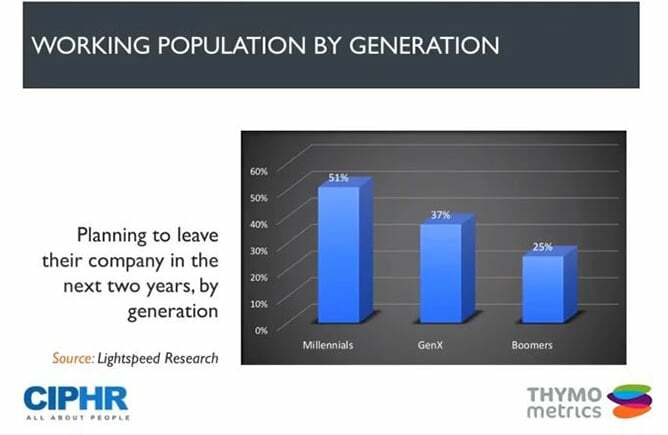 More than half of millennials plan to leave their company in the next two years – an alarming statistic.” High staff turnover is costly for organisations, he says, as you need to consider the cost of a recruiting a new team member, training costs, the potential loss of intellectual property to a competitor, and the resulting upheaval to teams – all of which ultimately affects the bottom line. One of the reasons why annual surveys have been popular is that HR departments can outsource their creation, compilation and analysis to a third-party provider – swiftly removing one item from their ever-growing to-do list. But, says Godden, always-on engagement isn’t difficult if you have the right tool. 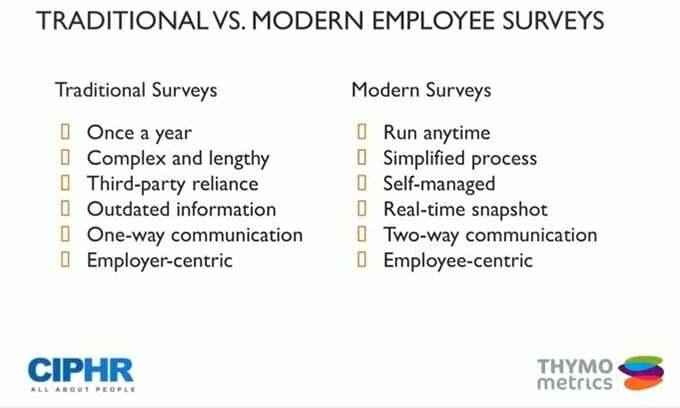 Thymometrics’ engagement survey enables employees to anonymously provide feedback on a number of key themes whenever they want. As well as assessing employees’ satisfaction on key themes, the tool also asks them to rate the importance of each element – so HR can better identify the areas that require their most immediate attention. In-built reporting dashboards enable HR and managers to instantly analyse results by, for example, subject, team, or location, and identify trends over time to assess the impact of interventions.